Pioneers in the industry, we offer api 674 high pressure pumps from India. Goma designs and manufactures reciprocating pumps in accordance to American Petroleum Institute- API 674 standards which cater specifically to continuous duty process application pumps that are required for the oil and gas industry. Goma has experience of more than 30 years and has over 250 installations of API 674 standards, not only in India but also around the world. The pumps are designed keeping each and every aspect of API 674 in view and our pumps are rugged, compact, reliable, power efficient, having advanced sealing technology and are highly proficient. Looking into specific applications of oil and gas in upstream, midstream and downstream applications, the pumps material of selection is done as per liquid characteristics, environmental conditions, and pressure requirements. The pumps are designed to have utmost reliability and also work in the most adverse conditions for pumping fluids. The accessories and auxiliary equipment’s such as pressure gauges, safety relief valves, pressure and temperature transmitters, isolation and bypass valves, discharge pulsation dampeners, suction stabilisers, strainers, self-supporting rigid skid, speed reduction gear boxes, control monitoring and instrumentation panel, filter skid etc. with the pump are also selected observing the API 674 requirements. All our API 674 pumps are inspected with precision and third party inspections are also conducted. Goma pumps are manufactured for rugged and robust functioning and are produced in nine frame sizes, each of which includes ranges of plunger sizes. 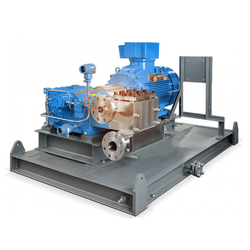 This is with the view to help in the selection of the ideal pump as per the requirement which are not only compact in design but are high pressure, are in power to weight ratio and are available with a varied choice of construction and seal material to suit the specific application. The Pump models are designed as per API 674 have flexibility to enable users to vary the pressure and flow rate combinations in a specific range as these pumps come with multiple plunger size kits pumps. All our designs, products and processes are quality certified by our wide-range quality system and extensive pump test facilities. Our key essentials of innovation, continual improvement and R & D and customer concentrated approach, we have positioned ourselves at the zenith of cutting edge pump design, solutions and prompt customer service. Our accolades include National Oil Companies from many countries having had a fruitful GOMA experience with our products and services. There is flexibility in the selection of material as per requirement. As per specification we provide Offshore design and coatings. Tailor-made solutions to meet precise client’s needs in agreement to API 674/ ISO 13710. Three runner skids are provided for easy mobility and for absorbing vibrations. Forged or cast steel fluid ends to suit the pressure and fluid are available in various material options to ensure compatibility with the pumping medium. Totally enclosed crank-case, with improved splash-gravity lubrication provides for continuous running with minimum attention. For severe service a forced feed system is also fitted. Heavy duty taper roller Main Bearings rated for continuous duty cycle at maximum design load. Hardened wearing parts in specially selected metals, with anti-friction bearings and bushes, mean long life. Light-weight Disc Valves for low NPSH availability. Special Abrasion Resistant Valves incorporating Polyurethane inserts for use on highly abrasive duty applications. Also, hardened metallic valve and valve seat available for wear resistance and long life. Pumps are designed to run between the maximum speeds stated as per API 674 norms.